Scientists have found one of the largest fields of seafloor vents gushing super-hot, mineral-rich fluids on a mid-ocean ridge that, until now, remained elusive to the ten-year hunt to find them. "The discovery of the first active vents ever found on an ultraslow-spreading ridge is a significant milestone event," said Jian Lin, leader of a team of Woods Hole Oceanographic Institution (WHOI) scientists who participated in a Chinese expedition to the remote Southwest Indian Ridge in the Indian Ocean in February and March. 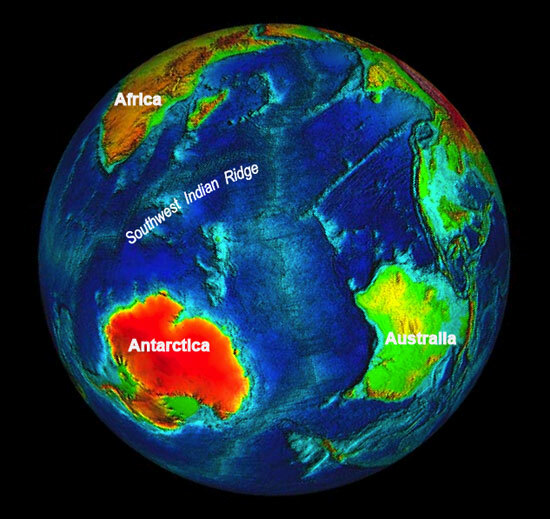 Since deep-sea hydrothermal vents were first discovered 30 years ago in the Pacific Ocean, scientists have studied them all along the Mid-Ocean Ridge, a 40,000-mile-long mountain range that zigzags through the middle of the world's ocean basins like a giant zipper. The ridge marks the area where the Earth's giant tectonic plates spreads apart and new ocean crust forms from hot lava rising from deep within Earth's mantle. Most studies of the chimney-like vent structures have taken place along ridges in the "fast-spreading" East Pacific Rise (100 to 200 millimeters per year) and the "slow-spreading" Mid-Atlantic Ridge (20 to 40 millimeters per year). Only in recent years have scientists explored "ultraslow-spreading ridges" (less than 20 millimeters per year) in the Arctic and Indian Oceans—remote areas tough to get to, and therefore the least studied. Scientists initially thought ultraslow-spreading ridges would be too cold to host large hot vents. But in the past decade, some scientists began to hypothesize that the slower a ridge spreads, the fewer vents it would have—but the bigger the vent fields would be. "This cruise confirmed that hypothesis," said Lin, a marine geophysicist and U.S. Coordinator of the 20-day expedition aboard the Chinese research vessel Dayang 1. "People have been looking for active hot vents on ultraslow ridges for more than 10 years," Lin said. In 2005-06, as part of China's first around-the-world oceanographic expedition, Lin had sailed as a US chief scientist on Dayang 1 to the Southwest Indian Ridge, where scientists found tantalizing evidence of active hydrothermal venting. They gathered critical data that led them back to the site this year. During the February-March expedition, the team nailed the discovery with the aid of ABE, WHOI's Autonomous Benthic Explorer, which has been instrumental in recent years in helping scientists find vents on the bottom of the ocean much quicker than ever before. ABE acts like a robotic deep-sea bloodhound: In a sequence of dives, its sensors "sniff out" clues indicating a plume of fluids emanating from a vent and collect data scientists use to home in on the vent. ABE also uses sonar to create maps of vent fields and takes photographs about 5 meters above them. ABE snapped 5,000 images of the robust Southwest Indian Ridge vent site, which is among the largest known to date. It is larger than a football field (120 meters by 100 meters). The discovery was a first for China. "This discovery reflects China's increasing contribution to ocean science in general, and ridge science in particular," Lin said. The China Ocean Mineral Resources R&D Association (COMRA) in Beijing, China, funded the 2005-06 expedition and ABE's participation in the current one. COMRA, which represents China in the International Seabed Authority, has been exploring the deep sea for mineral resources since the early 1990s. China is increasing investments in ocean science, Lin said. COMRA's primary interests lay in the large sulfide deposits created by hydrothermal vents, which are rich in copper, zinc, gold, and other minerals, he said. "Our Chinese colleagues were the happiest people I've ever seen at sea when they brought the first samples aboard," said Dana Yoerger, scientist in the WHOI Deep Submergence Laboratory and co-designer of ABE, who participated in the expedition. Once ABE pinpointed the site's exact location, the Chinese team sent down its "TV grab"— a grappling device guided by a television camera—and retrieved a reddish chunk of a vent chimney, Yoerger said. The researchers outran a tropical cyclone and collected the data they needed in just six days and three ABE dives. "It was the most ruthlessly efficient science we've ever done," said Christopher German, chief scientist of the WHOI-operated National Deep Submergence Facility, who also participated in the expedition. "We had no margin for error." The Chinese science party was led by chief scientist Chunhui Tao, a geophysicist at the Second Institute of Oceanography in Hanzhou, China. "The two international teams worked exceedingly well for this kind of complex operation," Lin said.